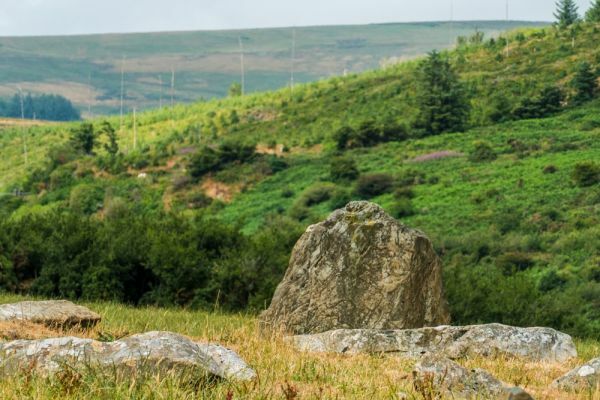 Dyffryn Syfynwy Stone Circle (sometimes known as the Duffryn Stones) is an elliptical circle of eighteen stones varying in height from 3 to 7 feet, surrounding a ruined ring cairn. Only 10 of the stones are still standing. 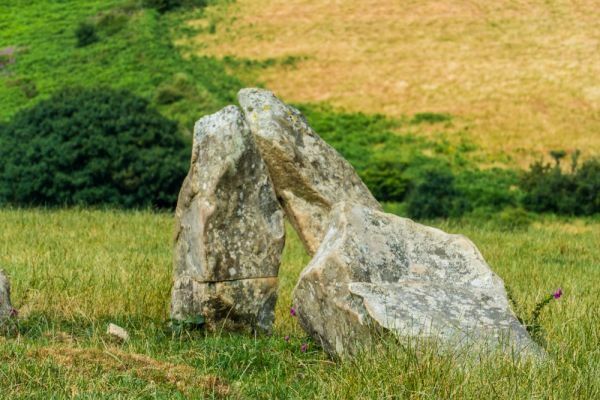 The easternmost stone is clearly taller than the other stones, but whether this has any significance is unclear. 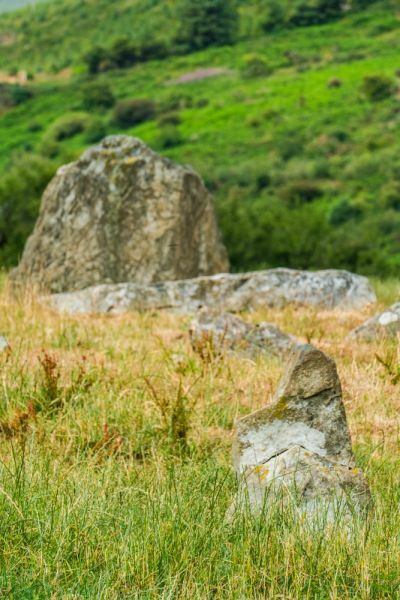 The stones are thought to have lined a ring cairn, though there is no obvious evidence of a cairn within the circle now. If there was a burial cairn, then perhaps the overly large stone was placed before the entrance to a passage leading into the burial mound. The other curious feature at Dyffryn Syfynwy is that several of the fallen stones have odd fluting, or shallow grooves running in parallel across their surfaces. 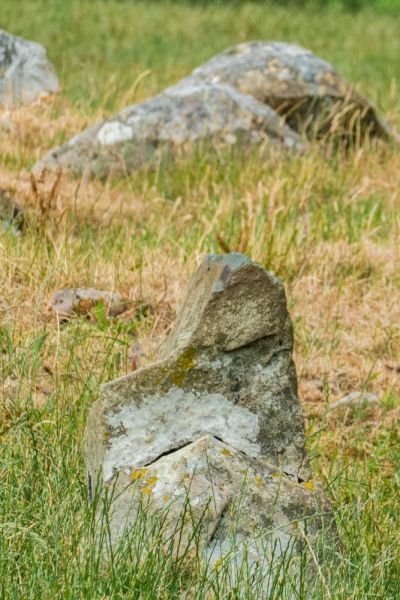 Though this may be a result of natural glacial action, perhaps the stones were chosen for the circle because of their odd patterned appearance. 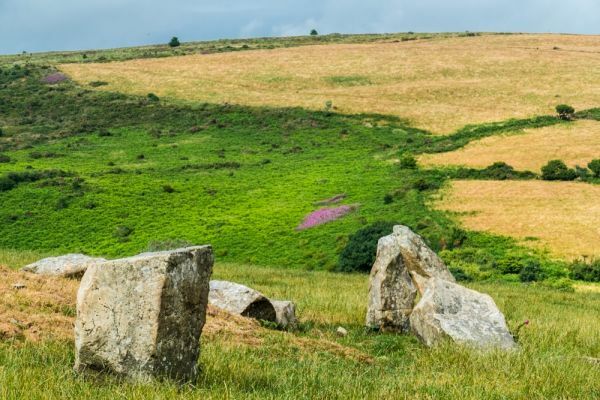 Written records from the early 20th century suggest that there were several outlying standing stones near the circle at that time. The stone circle stands within a farm field, and though there is no obvious public access you can still view the site quite clearly from the track that runs along the nearby fence. 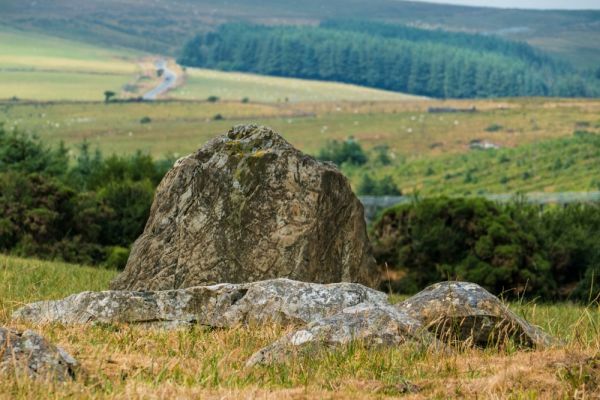 The site is listed as a cairn on OS maps, but should still be easy to find. There are footpaths off the minor road between Trebengych and Bernard's Well Uchaf (north-east of Tufton and Henry's Moat). You could park at the water reservoir on the north side of the road, hop the fence and cross the field behind it, but that route doesn't follow a public footpath and you should probably ask the farmer's permission first. Also, the only place to park by the reservoir is directly in front of the gates, which means if the utility company needs access, you'll be blocking the route. Far better is to park in front of the ruined farm buildings a hundred yards west of the reservoir. Cross the road and find the well-marked public footpath that leads off the road, turns right, and follows the field boundary behind the reservoir. The path leads over a style, into a farm field. The stone circle will come into view on your left at the end of the field. When we visited the field was full of steers grazing. Our arrival piqued their interest, and they followed very closely behind us, hoping to be fed. Though they weren't aggressive, they were very persistent and slightly unnerving. You can see the circle very clearly from the farm fence, on the course of the footpath. The footpath continues on, bypassing the field where the circle stands. We didn't feel great about hopping the farm fence without prior permission from the landowner, so we stayed on the public footpath and examined the circle from there. As you can tell by the photos, we had a great vantage point.